The home of Thomas Jefferson is under assault again – this time it is by Virginia’s leaders who are more concerned with being liked by America’s enemies than with doing their duty in their official capacities, and Muslim leaders who lie about their true intentions. 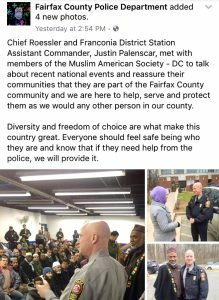 From the Fairfax County Police Chief Edwin Roessler – who feels it necessary to assuage the feelings of the Muslim Brotherhood’s Muslim American Society (see screen capture below) – to Congresswoman Barbara Comstock, Virginia Republican Chairman John Whitbeck, Virginia Delegate Sam Rasoul and others speaking at Muslim Brotherhood (MB) venues like the ADAMS Center, to Virginia Delegate John Bell falling over himself to praise senior Hamas/MB leader Imam Mohamed Magid, Virginia’s leaders are proving to be useful tools for our enemies. The ADAMS Center was founded by Ahmad Totonji, one of the original Muslim Brotherhood leaders in the United States. 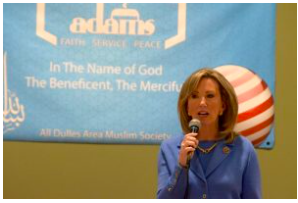 ADAMS prominently displayed its affiliation with the MB’s ISNA (Islamic Society of North America) on its website. ISNA is identified by the MB as the “nucleus” of their Islamic Movement in North America in their own documents, and identified by the U.S. government as an MB organization which funded the terrorist organization Hamas in the largest terrorism financing and Hamas trial ever successfully prosecuted in American history (US v HLF, Dallas, 2008). Mohamed Magid was the Vice President and then President of ISNA while he was, and continues to be, the Executive Director of the ADAMS Center. All Virginia officials should be aware, the above comments refer to EVIDENCE in the largest terrorism financing trial ever successfully prosecuted in American history. The people they are hanging out with are called “Jihadis” or “terrorists” if you prefer. And these jihadis lie in order to build relationships with people of influence and then use the relationships to further their cause. 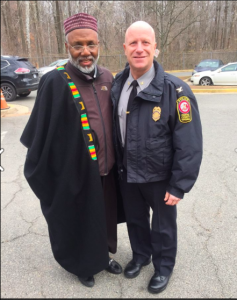 This way, when people who speak truth about the Islamic threat step forward, it is the Fairfax County Police Chief, a member of Congress, a Virginia delegate, a pastor, or someone else in the community who speaks out so the jihadis don’t have to. This is called Civilization Jihad by OUR hands. The Muslim Brotherhood gets our leaders to do their bidding for them. Virginia officials have a responsibility and duty to know this, and Virginians have the right to know their leaders are not conspiring with and aiding and abetting America’s enemies. U.S. Congressman Gerry Connolly held a fundraiser in 2014 coordinated by Muslim Brotherhood leaders. America’s enemies are raising money for Congressman Connolly? That speaks volumes of how helpful he must be to their cause. Former Virginia Governor now U.S. Senator Tim Kaine actually gave a Lifetime Achievement Award to Jamal Barzinji, one of the original founding members of the U.S. Muslim Brotherhood who created and founded their first organizations in the United States. Barzinji is now deceased, but Kaine is very much alive continuing to aid and abet Hamas/MB organizations and leaders. Senator Kaine also worked closely with Hamas/MB leader Esam Omeish and appointed him to the Virginia Immigration Commission. A perfect place for a suit-wearing jihadi to be…if we want to lose the war. Virginia’s Republicans and Democrats seem to be incapable of reading, processing facts/evidence, and making decisions that comport with federal law and the laws of the Commonwealth of Virginia, and simple good judgment. 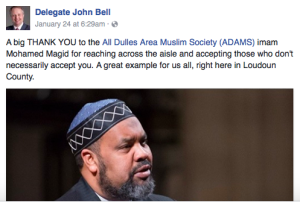 Virginia residents may not want to look to the Virginia Legislature for help since it passed a Resolution in March 2014 – led by Delegate Alfonzo Lopez – praising one of the most prominent Hamas/Muslim Brotherhood mosques in the United States – the Dar al Hijra Islamic Center. Dar al Hijra was founded by Jamal Barzinji, and their original title was held by NAIT (North American Islamic Trust) – the Muslim Brotherhood’s bank in North America. Again, this is all called EVIDENCE for those keeping track. Good luck Virginians. Thomas Jefferson, who waged the first war America fought after the Revolution against the Muslims of the Barbary States, must be rolling over in his grave. Given that neither the U.S. Constitution nor the United States Criminal Code accommodate any “DIVERSITY” arrangement with jihadist savages, and contextual diversity constitutes nothing more than an insidious Muslim-Brotherhood-driven suicide pact, rather than propagandizing Virginians with the quintet of rigidly enforced personal behavioral standards, comprised of cultural, military, political, social and religious elements collectively referred to as “Islam” (the latter of which, incidentally, mandates the death penalty for deviates) which the Fairfax County Virginia Police Chief and his Franconia District Commander presumably know little or nothing about, inasmuch as it would appear that as of today the party is over at the Department of Justice, said officials would be well advised to re-read their oaths of office then study the U.S. District Court evidentiary document, GOVERNMENT EXHIBIT 003-0085/3:04-CR-240-G U.S. v. HLF, et al. Thanks JG for the posting. How do we get the word out to the average “Joe” and churches that have been “snowed” to rally concerned citizens to get the word out to combat the lies? 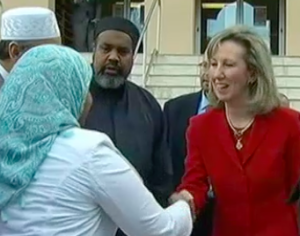 Should I and my fellow Fauquier County, VA residents be concerned the next time Imam Nahidian is invited to speak at an “interfaith unity” rally in Warrenton? In hearing the beginning of the Imam’s You Tube video – https://www.youtube.com/watch?v=KaliQwrzjDA – I believe I hear “this” or “these” or “them.” Is he hinting that the President is causing the far left state of unrest? Great tie into Jefferson who had his concerns regarding the Quran (see JA’s Jefferson’s comments RE the Quran to the below FauquierNow posting). *Warrenton “Unity Rally” or Protest? IS THE VIRGINIA INTERFAITH CENTER FOR PUBLIC POLICY A POLITICAL ORGANIZATION? SHOULD VIRGINIA INTERFAITH CENTER FOR PUBLIC POLICY BE CONCERNED ABOUT IMAM NAHIDIAN’S VIEWS AND TIES TO IRAN?